A new study, led by climate scientist and Lab co-director Robert Kopp, links a framework for global and local sea-level rise projections with simulations of two major mechanisms by which climate change can affect the vast Antarctic ice sheet. It shows that future sea level rise may be more than previously thought, but just how much won’t become evident until after mid-century. Kopp is Director of the Institute for Earth, Ocean, & Atmospheric Sciences and professor in the Department of Earth and Planetary Sciences at Rutgers University and a sea-level rise expert. Below, Kopp explains the findings and key takeaways for stakeholders. Consider two roads. One leads to 2 feet of global-average sea-level rise over the course of this century, and swamps land currently home to about 100 million people. The other leads to 6 feet of rise, swamping the homes of more than 150 million. Our new study, published today in the journal Earth’s Future, finds that – at least from measurements of global sea level and continental-scale Antarctic ice-sheet changes – scientists won’t be able to tell which road the planet is on until the 2060s. But our study also shows that the world can make the 2-foot road much more likely by meeting the Paris Agreement goal of bringing net greenhouse gas emissions to zero in the second half of this century. And through detailed studies of the local physics of ice-sheet changes and more refined reconstructions of ice-sheet changes during warm periods of the geological past, scientists may become able to distinguish between the two roads sooner. Until then, though, decision-makers at all scales – from homeowners to governments — should plan for the future cognizant of this ambiguity. The new findings stem from an analysis that links a widely-used framework for projecting how sea level around the world will respond to climate change to a model that accounts for recently identified processes contributing to Antarctic ice loss. It’s hard to project future changes in the ice sheets that cover massive, mostly uninhabited land of Greenland and Antarctica. The continental-scale behavior of the ice sheets depends upon difficult-to-model physics taking place at a much smaller scale. Especially in West Antarctica, where much of the ice sheet sits below sea level, complex interactions at the edge of the ice sheet can sensitively affect the rate of ice-sheet retreat. Marine-based ice sheets are vulnerable to several types of instability. One, which has been studied for decades, is ‘marine ice-sheet instability.’ Imagine an ice sheet sitting – as much of West Antarctica does – in a bowl that gets deeper the more inland you go. As the ice margin retreats, the area of ice sheet exposed to ocean water grows. More exposure leads to a faster rate of retreat, causing a vicious cycle that stops only when the depth of the bowl stops growing. One recent modeling study focused on this mode of instability estimated that the Antarctic ice sheet has a 1-in-20 chance of contributing about 30 centimeters (1.0 feet) to global average sea-level rise over the course of this century and 72 centimeters (2.4 feet) by the end of the next century. Another study found Antarctic ice melt driven by rising greenhouse gas emissions could raise global sea levels by up to 39 centimeters (1.3 feet) by 2100. But this is not the only potential mode of ice-sheet instability, and physical ice-sheet models incorporating only this mode of instability have difficulty reproducing the shrunken Antarctic ice sheet that appears to have characterized past geological warm periods. Ice shelves are floating masses of ice on the edge of the continental ice sheet. Since they are already floating, when they melt, they have little direct effect on sea level. But they play an important role in protecting the land-based ice. They slow the flow of ice from the continent into the ocean and act as a buffer, preventing the formation of large cliffs of land ice. If they disappear, these protections also disappear. In hydrofracturing — the process implicated in the infamous break-up of the Larsen B ice shelf in 2002 – rainfall or meltwater that pools on the glacier’s surface drains into cracks. This fractures the ice shelf. Newly exposed ice cliffs, left unguarded by an ice shelf, collapse under their own weight, a phenomenon currently observed only in some narrow glacial channels in Greenland. Rob and Dave’s research found that these processes give rise to the potential for more than one meter of global average sea-level rise from Antarctica alone over the course of this century, and more than 15 meters over the next five centuries. But Antarctica is not the only driver of sea-level rise. To know what these high numbers mean for local changes on the world’s coastlines, you need a framework that accounts for all the key drivers: among them not just Antarctica, but also Greenland, mountain glaciers, the expansion of the warming ocean, changes in winds and current, shifts in Earth’s gravitational field, and land motion. To do this, we linked the results from Rob and Dave’s 2016 model to a framework for global and local sea-level rise projections that we published back in 2014. In so doing, we extend to a global scale an approach that had already been taken locally by some stakeholder processes, such as the Boston Research Advisory Group and the Fourth California Climate Assessment. Our older projections, which were developed to be consistent with some key findings of the Intergovernmental Panel on Climate Change (IPCC)’s Fifth Assessment Report, assumed a steady increase in the rate of ice-sheet shrinkage. The new projections reflect the growing body of research about the different modes of ice-sheet instability. Nonetheless, our sea-level rise projections for the first half of this century are not strongly affected by the way Antarctica is modeled, nor are they strongly tied to global greenhouse gas emissions trends. Regardless of emissions pathway and approach, there is likely to be between about 16 and 40 cm (0.5 and 1.3 feet) of global average sea-level rise in the first half of the century. But the picture is quite different beyond 2050 if the Paris Agreement goal of net-zero emissions is not met – a finding that could have major consequences for coastal populations, and for planners hoping to integrate climate resiliency into future projects. For a future of continued growth in emissions the new results indicate a likely global average sea-level rise between 1.1 and 2.1 meters (3.6 to 6.9 feet) – roughly double the IPCC-consistent estimate. If emissions continue down a mid-range path – one consistent with the direction current policies and market trends seem to be taking us – the new results indicate a higher likely rise of 0.7 to 1.3 meters (2.2 to 4.1 feet), compared to 0.4 to 0.8 meters (1.4 to 2.5 feet) in the IPCC-consistent estimate. And bringing net greenhouse gas emissions to zero in the second half of the century, as envisioned in the Paris Agreement, yields a likely rise of about 0.4 to 0.8 meters (1.2 to 2.6 feet) under the new projections, little changed from the IPCC-consistent projections. Median projections of global mean sea level over the course of this century for low, median, and high emissions futures. Bars at right indicate the ‘very likely’ (roughly 9 chances in 10) range for 2100. Maps show median projections for 2100 under the high emissions future. The approach taken in our analysis requires a good degree of caution, since Rob and Dave’s 2016 study was not an attempt to estimate the probability distribution of future changes. Rather, they tested a range of potential values for key parameters of their model and retained those consistent with the paleo-sea level estimates, but they did not explore the full space of possible values within their ranges. They did not account for modern observations in calibrating marine ice-sheet instability, or probe rates of ice-cliff collapse as fast as the fastest currently seen in Greenland. Moreover, their study remains quite controversial within the glaciological community. Nonetheless, swapping their projections into our projection framework provides a useful method for assessing the global and local hazards associated with their new findings. The more dynamic picture in the new simulations suggests that the rate of change in the first half of this century — which does not involve a significant contribution from processes like marine ice-cliff instability, or hydrofracturing – is essentially uncorrelated with the rate of change later in the century. The Antarctic could follow a mid-range projections in the near term but still end up on an extremely high-end projection by the end of the century. This implies that large-scale observations – for example, of global mean sea-level change or of the change mass of the Antarctic ice sheet – will not on their own significantly narrow the range of late-century sea-level projections for decades to come. A world leading to 2 meters of 21st century sea-level rise is not clearly distinct from a 50-centimeter world until the 2060s. Narrowing the range of late-century projections earlier than that will require studies focused on understanding smaller-scale ice-sheet physics and tightening the constraints provided by the geological record. Both mid-century and subsequent sea-level rise are uncertain, but their uncertainties are different in character. 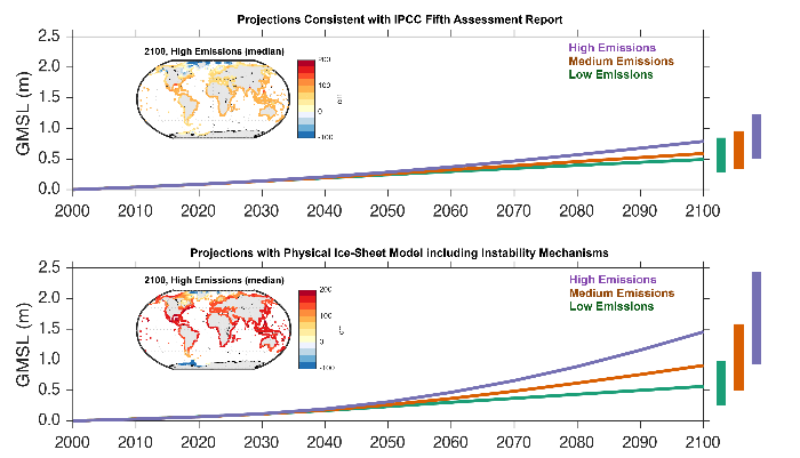 The contrast between the relative insensitivity of mid-century projections to emissions and approaches and the high sensitivity of late-century projections highlights what is sometimes called ‘deep uncertainty’ or ‘ambiguity’ in the latter. Given the current state of the science, both the IPCC-consistent projections and the newer projections provide defensible estimates of the likelihoods of different late-century outcomes, but they differ considerably. This suggests that adaptation decisions need to be made using approaches that are robust to this ambiguity. Ice-sheet modeling research is in a state of rapid development. Moreover, it’s possible that even with a much-advanced understanding of ice-sheet behavior, it may take decades of observations to narrow the range of late-century projections. This suggests that, for sea-level adaptation choices with consequences beyond the next 30 years, traditional benefit-cost analysis is of limited utility; decision-makers may need to bring alternative tools to bear. In some cases, this may take the form of flexible adaptation pathways, with decisions made now for the next 30 years and decisions on the timing and sequencing of alternative options, conditional on future sea-level rise, planned out in advance. The United Kingdom, for example, took this approach with the Thames Estuary 2100 project. More generally, sea-level researchers need to work with social scientists and decision-makers to render their projections actionable. Climate Central’s new website “Surging Seas: Stakes Rising” provides maps of flooding associated with the study’s local sea-level rise projections.